This "Rainbow Crossing" is on the corner of Bourke Street and Campbell Street at Taylor Square, in the inner city suburb of Darlinghurst. 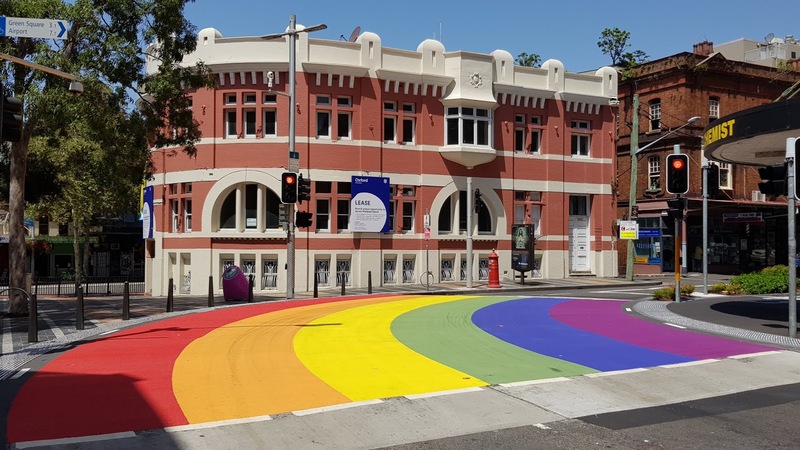 The crossing was installed for this year's Sydney Mardi Gras coming up on Saturday night. The former Commercial Bank building, which is available for lease, stands behind it. Linked to: Signs, Signs, Fences Around The World, Thursday Doors. ...Jim, you live in the land of rainbows too. Dazzling colors, mysterious shadows---who could ask for more? That is so big and bright!! Love it.